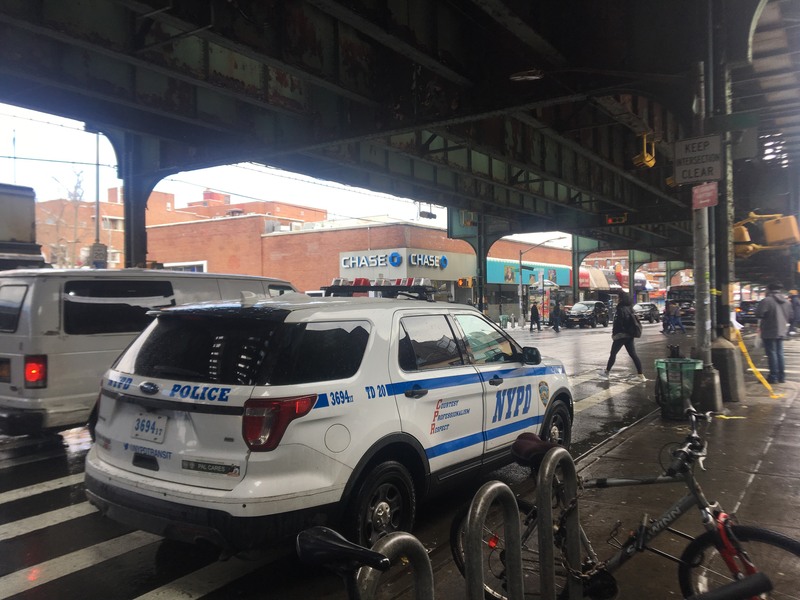 Residents of Jackson Heights were horrified — but not surprised — that a pedestrian had been struck and killed in the intersection of 75th Street and Roosevelt Avenue early Monday morning. Neighborhood have long complained about safety in the congested area where the pedestrian, whose name was not released, was run over by the 55-year-old driver of a Q33 bus at around 2:30 a.m. And statistics show 23 crashes in the blocks around that key transit stop, resulting in 14 pedestrian and 3 cyclist injuries, since 2016. Cristina Furlong, co-founder of advocacy group Make Queens Safer, said the city should install pedestrian islands on either side of the 74th Street transit hub, which includes the MTA bus terminal. She also pointed out that heavily immigrant, working-class neighborhoods tend to be the ones that don’t get much attention from city officials. Some residents specifically blamed the influx of app-based taxis such as Ubers and Lyfts for adding to the congestion and competition in recent years. “All these Ubers, they run red lights, they’re in a rush to get where they’re going,” said a pedestrian on Roosevelt who gave Streetsblog the name Gould. This isn’t the first time an MTA bus has taken a life in the area. A Q53 bus struck and killed 25-year-old Martha Tibillin-Guamug in 2014 as she crossed Broadway near Roosevelt. The Department of Transportation has been aware of the conditions in the neighborhood since it conducted a case study in 2010. Since then it has made efforts to calm traffic in the neighborhood by adding bike lanes on other area streets and turning a portion of 37th Road into a pedestrian plaza to eliminate roadway conflicts. The neighborhood has landed back on the list of priority areas in the DOT’s 2019 pedestrian safety plan update. I lived in Jackson Heights from 2009-2014 and Roosevelt was always a danger zone. I still frequent the area, and in my experience, the danger was/is from cars turning from Roosevelt onto the streets and from people who just seem to amble in front of buses. When I was/am in the area, I often take the Q32 and Q33 down Roosevelt and it’s amazing how many people (seniors, especially) will slowly and brazenly walk in front of buses with green lights as you get closer to the train station. I’m not saying that was the case in this crash, but frankly, I’m surprised there aren’t more crashes on Roosevelt because of this. Roosevelt is a crazy place because you want the buses to move faster, but then everything ends up moving faster and it becomes dangerous for cyclists and pedestrians. Can Staten Island’s North Shore Become NYC’s Next Great Neighborhood?